This month, the Government of China released its 13th Five-Year Plan, which lays the foundation for the country’s development through 2020. This Five-Year Plan explicitly states that China aims for an environmentally and economically sustainable model for its future development. Kudos to the Chinese government for pursuing a sustainable long-term agenda, but that plan also poses problems at home and abroad that must be addressed. Namely, the vision for a greener China threatens to deal a deathblow to China’s declining domestic logging industry and, ironically, may end up exporting environmental damage to other, more vulnerable countries. For more analysis, see the new Forest Trends brief China’s Logging Ban in Natural Forests: Impacts of Extended Policy at Home and Abroad. Already, the logging ban has eliminated a significant source of domestic jobs and labour: Through 2014, natural forests provided over half of the country’s total domestic timber production and were essential to the broader forestry industry and its employees. To compensate for the ban’s adverse economic impact on the sector, the central government has allocated 2.35 billion yuan (about US$379 million) a year to cover foresters’ loss of livelihood between 2014 and 2020 – a major undertaking with yet-to-be-determined economic implications. Ironically, the vision for a greener China may end up exporting environmental damage to other, more vulnerable countries. The ban will also affect the availability of certain wood species for trade and manufacturing. While China’s ambitious plantation programs will continue to be able to make up for some of these shortages, specific species from natural forests can typically not be easily substituted from plantation areas. This is particularly true for some species that grow in northeastern China, including Mongolian oak, Chinese ash, and Korean pine – all valuable and commercially significant hardwood species that are particularly prized by flooring, furniture, and plywood industries. That’s not to say that these commercially desirable species will be completely off limits in natural forests. 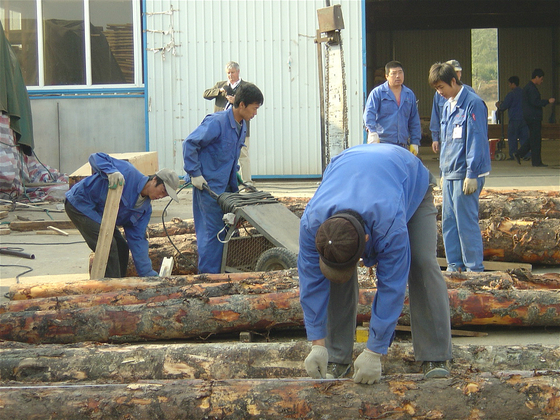 While the ban may make it more difficult tolaunder wood through China’s market, some quantity will remain available through both legal and illegal channels, possibly undermining the ban’s purpose. One concerning loophole is thatnon-commercial logging is allowed as long as no more than 49.5 million m3 is harvested during the next five years – that covers forest management practices like “forest thinning” for the sake of tree growth and overall health. The caveat here is that in many countries, thinning has been regularly invoked as a pretense for more intensive logging. Add to that some additional volume of these wood species that’s bound to reach the market as a result of plain-old illegal logging. The logging ban will likely also have ripple effects in other countries’ forests. 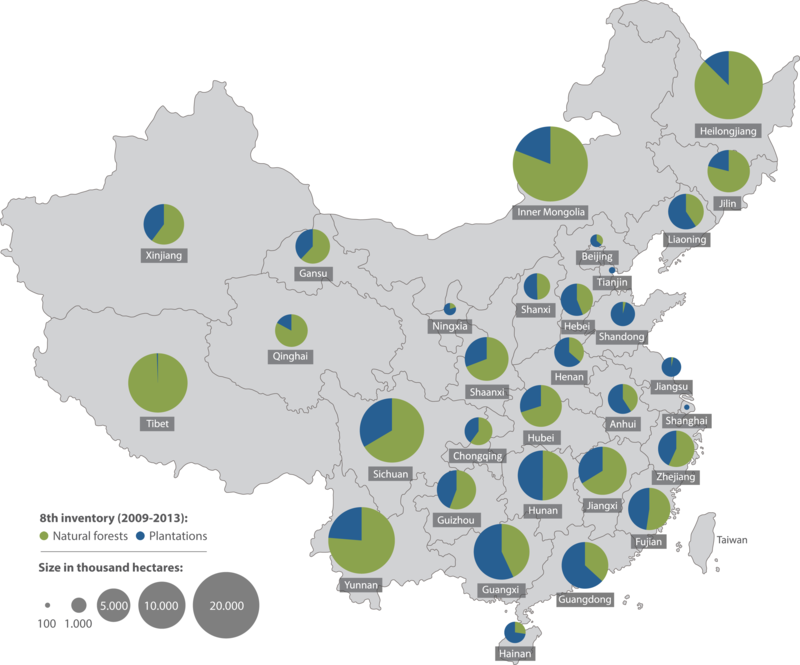 As it is, imported timber accounts for more than half of China’s total timber supply. With the new logging ban in place, China is expected to fix its gaze abroad to meet domestic demand with even more imported timber. Already, evidence suggests that a large portion of the wood imports entering China are illegally sourced – particularly certain rosewood species from the Mekong region of Southeast Asia and, increasingly, from Africa. In addition, the limited availability of desirable species that plantations can’t supply could exacerbate the existing illegal logging issues in the Russian Far East, whose temperate forests border China’s and share many of the same species. Intensifying the demand for these imports could inflict additional damage to already-vulnerable forests by making both legal and illegal channels to China more lucrative for international traders. In essence, by protecting its own natural forests without diligently ensuring the legality of the wood it imports, China is simply “exporting” environmental harm — often to countries with poor governance and enforcement where regulations are routinely undermined. In order for China’s efforts to work towards a more sustainable future to be sustainable for the planet adequate protections against inadvertently promoting ecological damage elsewhere need to be in place and reinforced. Sun Xiufang is a Program Analyst with the Forest Policy, Trade and Finance Initiative. Based in Beijing, her work focuses on forest market and trade analysis.